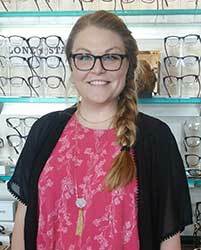 Lauren Romero is a technician at Texas State Optical. She assists our doctors by conducting the pre-testing segment of our patient visits. Lauren was born in Kansas City, MO but has lived in Texas most her life. Lauren enjoys spending time with her husband and chi-weenie. In her spare time you can find her enjoying the nice weather outdoors, crafting, or advocating in the Alzheimers community.